The Red Cross says it has evacuated 148 mostly disabled and elderly civilians found in a part of the Syrian city of Aleppo recently recaptured by the army. They were trapped for days inside a former old people’s home in what was a rebel-held part of the Old City because of heavy fighting nearby. Many had injuries or conditions which left them unable to move. Eleven others died before they could be reached, either caught in the crossfire or because of a shortage of medicine. In the past three weeks, government forces have retaken about 75% of eastern Aleppo, which rebels had controlled for four years. The evacuation of the Dar al-Safaa old people’s home was a joint operation by the Syrian Arab Red Crescent (SARC) and the International Committee of the Red Cross (ICRC). It took place late on Wednesday night, hours after troops took full control of the Old City’s Meshatyeh district. The old people’s home, the role of which expanded because of the conflict, had been accommodating patients with mental health needs or physical disabilities, according to an ICRC statement. Three dozen other civilians, a number of them injured, had also sought refuge there. 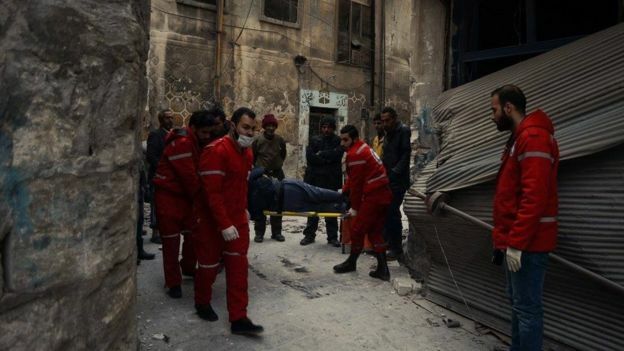 “These patients and civilians had been trapped in the area for days because of heavy clashes nearby and as the front line kept drawing closer,” said the ICRC’s head of delegation in Syria, Marianne Gasser, who is currently in Aleppo. Of those rescued, 118 patients were taken to three hospitals in government-controlled western Aleppo, while 30 men, women and children were taken to shelters, also in the west of the city. Six orphaned and very young children were among the evacuees. 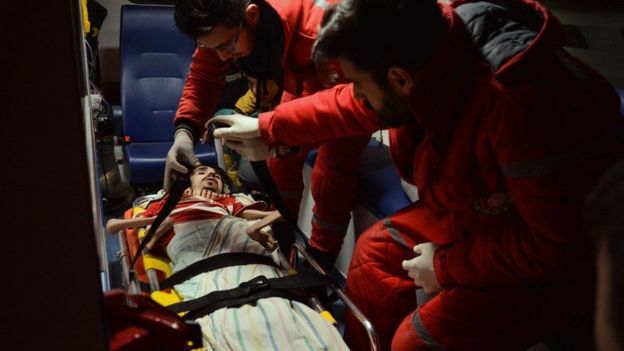 An ICRC spokesman based in Damascus, Pawel Krzysiek, told the BBC that the patients had been “practically forgotten” and that tragically for some the evacuation operation had come too late. Next: Letter from Africa: What has gone wrong for Nigeria’s President Buhari?